Dissociative Identity Disorder - body, causes, What Is Dissociative Identity Disorder? Dissociative (di-SO-see-a-tiv) identity disorder (DID) is a severe mental disorder in which a person has two or more distinct sub-personalities that periodically take control of the person's behavior. Before 1994, DID was called multiple personality disorder (MPD). Dissociative identity disorder (DID) is the most complex of a group of disorders characterized by the process of dissociation (di-SO-see-ay-shun). Other dissociative disorders include amnesia * , fugue * , and depersonalization * . Dissociation is a defense mechanism that allows an individual to separate or "go away from" thoughts, memories, emotions, or events that are highly stressful. This process helps the individual deal with situations that would otherwise be intolerable. Because dissociation is an unconscious process, the person experiencing it is not aware of any personality changes that occur during an episode. Mentally healthy people often experience mild forms of dissociation, such as daydreaming or getting lost in a book or a movie. Most people, especially adolescents, also find that different aspects of their personality tend to come out in certain situations or with certain groups of people. These changes in personality are normal. DID, however, involves extreme and repeated dissociation that interferes with a person's normal functioning and can result in memory gaps and identity confusion. By repeatedly dissociating and blocking out painful or unpleasant memories, a person with DID develops two or more distinctly different, often colorful or dramatic, identities. People with DID may have between 10 and 15 sub-personalities, and some people may even have more than 100. Often these sub-personalities can differ in gender, style, voice, and psychological make-up. People with DID may discover unfamiliar articles in their homes that they have purchased while their behavior was controlled by a different sub-personality, and they may have conversations when one sub-personality is dominant that other sub-personalities cannot remember. Some life events and memories (particularly traumatic ones) are known to certain sub-personalities but remain unknown to others. * amnesia (am-NEE-zha) is the loss of memory about one or more past experiences that is more than normal forgeffulness. * fugue (FYOOG) refers to a psychiatric condition in which people wander or travel and may appear to be functioning normally, but they are unable to remember their identity or details about their past. * depersonalization (de-per-sonal-i-ZAY-shun) is a mental condition in which people feel that they are living in a dream or are removed from their body and are watching themselves live. Is Dissociative Identity Disorder a Real Disorder? The diagnosis of DID is the subject of controversy in the psychiatric community, Throughout history there are records of the occasional dissociated person who has behaved oddly. These people often have been described as "possessed," and later they have been unable to recall their behavior during the possession. In some cultures, these people are still considered possessed, and they are treated with exorcisms to drive out the demons that control them. However, prior to 1980, multiple personality disorder (MPD), as DID was then called, was considered to be a rare psychiatric disorder; only a few hundred cases in several centuries of recorded medical literature had been documented. 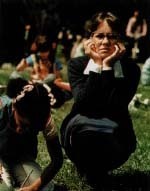 Sybil (1976), starring Sally Field, told the true story of a woman who was so severely abused as a child that she developed over 16 different personalities. This highly acclaimed television movie helped to raise the public's awareness of DID. In 1956, a fictionalized story (later made into a movie) called The Three Faces of Eve helped introduce the public to the idea of MPD. In 1973, the subject was brought before the public again with a documentary, Sybil, which portrayed a woman with 16 different personalities. Since then, some psychiatrists have questioned the accuracy of the Sybil story. However, since about 1980 the number of people diagnosed with DID has increased sharply, and some psychiatrists estimate that as many as 1 and 3 percent of Americans may suffer from the disorder. One group of psychiatric professionals recognizes DID as a common and serious psychiatric disorder. They believe that DID is caused by repeated severe physical, emotional, or sexual trauma or abuse in early childhood. Children find these experiences too terrible to remember, so they repress them and mentally "go away" in order to cope with daily life. Later, these traumatized children develop multiple sub-personalities to deal with the repressed memories. When under stress in adulthood, certain triggers cause the switching from one sub-personality to another as a way of coping. The sub-personalities may have different psychological problems and may even have different physical traits. They may even have distinctive handwriting or different allergies! Psychiatrists who support DID as a common disorder point to the fact that child abuse is common, and because dissociation is a very effective coping tool for people who are powerless to change their situations, DID is therefore also likely to be genuine and common. A second group of psychiatric professionals thinks that DID rarely develops on its own in a person. They believe that DID is unknowingly created by interactions between the therapist and the patient when patients are highly susceptible to the suggestions of the therapist. This group of psychiatrists believes that in some cases therapy causes patients to recover memories of abuse that did not really happen and to unconsciously invent sub-personalities. Because the abuse that is supposed to cause DID happens in early childhood, it is often impossible to confirm any trauma that the patient describes. This doubting group of psychiatrists points out that symptoms of DID are detected by friends or family members only after therapy has begun. They note that DID is rarely seen in children, and that many children who survive stressful events such as extreme abuse, war, kidnapping, or genocide do not suffer from DID. The validity of recovered memories is highly controversial. Psychiatrists are divided on whether recovered memories, especially those recovered under hypnosis, are real or if they have been unwittingly suggested to the person through therapy, news stories, or ideas they have gotten from relatives or loved ones. This complicates the issue of whether DID is caused by early childhood trauma and abuse. Almost all (98 to 99 percent) of people diagnosed with DID seem to have experienced severe trauma before age nine. However, only a small percentage of all people who experience documented childhood trauma develop DID. DID is difficult to diagnose. People with DID have distinct multiple sub-personalities, but within each sub-personality they tend to be consistent. To diagnose DID, a doctor must see two or more distinct sub-personalities that each become dominant for a period of time. Sometimes doctors use hypnosis to try to bring out different sub-personalities. People with DID can also have many other symptoms. Almost every person who has been diagnosed with DID has been in the mental health system for a long time (an average of seven years in one study) and has had previous, presumably incorrect, diagnoses before a diagnosis of DID is made. People with DID usually show signs of other psychiatric and/or physical disorders, including amnesia, time loss, depression * , severe mood swings, sleep disorders, alcoholism, drug dependency, panic attacks * , anxiety * , phobias * , auditory and/or visual hallucinations * , eating disorders * , headaches, trances, and violence toward themselves or others. It takes careful evaluation over time to understand whether certain symptoms indicate DID or other conditions. DID differs from schizophrenia * and psychosis * , although they all may share some symptoms. Schizophrenia is not a "split personality" (like the fictional Dr. Jekyll and Mr. Hyde), but a disorder of reality and thought. Unlike people with schizophrenia, people with DID are in full control of their thoughts, although they may be unable to remember large portions of their life when their behavior is being controlled by a different sub-personality. Unlike people with psychosis, who often have visual or auditory hallucinations, people with DID generally do not have bizarre, uncontrolled thoughts or serious problems in how they sense reality. Within each sub-personality a person with DID may function well. * panic affacks are periods of intense fear or discomfort with a feeling of doom and a desire to escape. During a panic attack, a person may shake, sweat, be short of breath, and experience chest pain. * anxiety (ang-ZY-e-tee) can be experienced as a troubled feeling, a sense of dread, fear of the future, or distress over a possible threat to a person's physical or mental well-being. * phobias (FO-be-as) are intense, persistent fears of a particular thing or situation. * hallucinations (huh-LOO-sin-AY-shuns) are things that a per-son perceives as real but that are not actually caused by an outside event. They can in-volve any of the senses: hear-ing, smell, sight, taste, or touch. * eating disorders are condi-tions in which a person's eat-ing behaviors and food habits are so unbalanced that they cause physical and emotional problems. * schizophrenia (skit-so-FRE-ne-a)is a serious mental disorder that causes people to experience hallucinations, delusions, and other confusing thoughts and behaviors, which distort their view of reality. * psychosis (sy-KO-sis) refers to mental disorders in which the sense of reality is so impaired that a patient can not function normally. People with psychotic disorders may experience delusions, hallucinations, incoherent speech, and agitated behavior, but they usually are not aware of their altered mental state. How is Dissociative Identity Disorder Treated? Therapists who believe that DID is brought about by childhood trauma use a technique called integrative psychotherapy * . This form of therapy involves recovering repressed or dissociated childhood memories and making them a part of a single personality in order to help the person become whole and reengage with the world. Often this process is emotionally painful because it involves facing past trauma. The use of hyp-nosis to recover memories of childhood trauma is controversial and not accepted by all mental health professionals. Therapists who believe that DID is unknowingly created in susceptible patients by well-meaning therapists believe that the correct treatment is to discontinue therapy. Both groups agree that medication does not often help the dissociation that occurs in people with DID, but it may help with other symptoms. * psychotherapy (sy-ko-THER-a-pea) is the treatment of men-tal and behavioral disorders by support and insight to encour-age healthy behavior patterns and personality growth. Schreiber, Flora Rhea. Sybil. New York: Warner Books, 1974. The National Alliance for the Mentally Ill (NAMI) is a nonprofit organization that provides education, support, and advocacy for people with severe mental illnesses and their families. NAMI's website provides information about many mental illnesses, including DID.